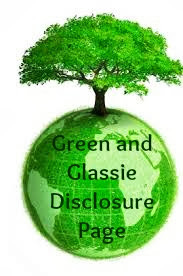 Green and Glassie: Make sure Your Basement Stays DRY! Make sure Your Basement Stays DRY! We have a regular sump pump to keep the water out of the basement. In case we lose power we have installed a battery back-up system. The battery will keep the sump pump running for 72 hours. Just in case the sump pump stops and the battery back up fails we have installed a warning system. 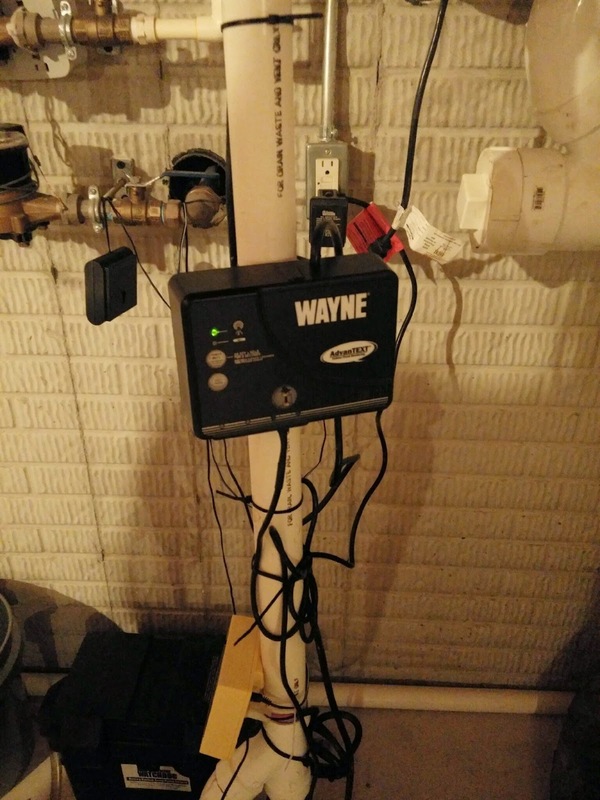 The Wayne AdvanTEXT Sump Minder / Alarm will send three phone numbers a text when the water level rises. Yep, a text on our phone! This is a great system for us because we travel quite a bit. Being away from the home we often worry about the sump pump system - especially when we watch the weather and we know home is having server thunderstorms. Now we are worry free since the system will also send us a text - letting us know to have the neighbor or family check the pump. Our thoughts are that the odds of three systems failing are slim which gives us tremendous peace of mind that our basement will remain dry. The system works great. People often ask if we could do it over again would we do the same thing? In this case our answer would be no. If we could start all over with the system we would of went to Wayne Sump Pumps first. That have great systems that incorporate all three devices into one! By going to Wayne Sump Pumps first we would of saved time and money. We purchased our Wayne Advan TEXT Sump Reminder/Alarm from Amazon. My basement doesn't flood thankfully, but my parent's does. I remember they always had to run a pump when I was younger. Our old house could have used this alarm for sure! What a great product! 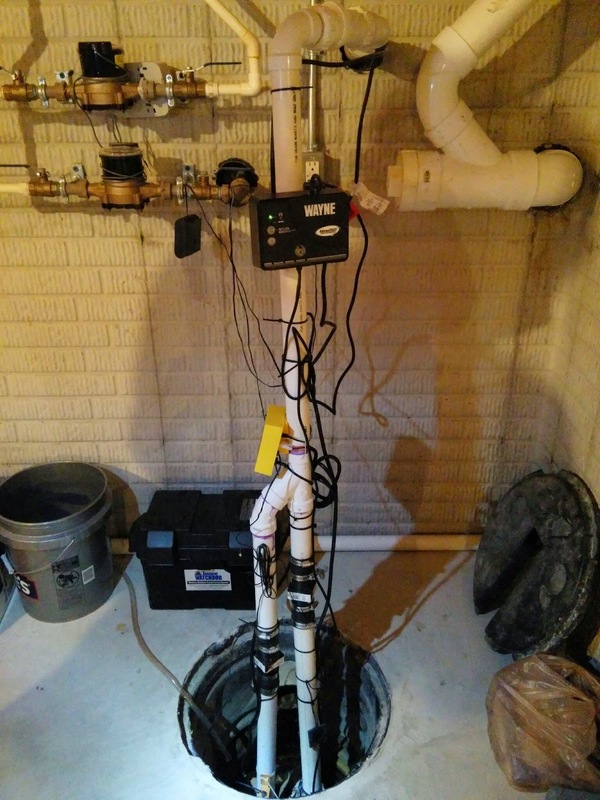 We check our sump pump regularly and always make sure our back up is good to go. No flooding, please! I was surprised when they cracked open the lid on our sump pump area and it was full of water. Thank goodness we never had any issues while we lived there because I would have lost so much stuff. Now we don't have a basement, whew. Basements are extremely rare here in the Las Vegas area but with much of my family being from back East, I am aware of how popular they actually are. This technology looks awesome and I am sure the peace of mind it offers is so reassuring! Any home that has basement needs one of these! I've had way too many friends that have had to deal with flooded basements. Really a smart move to get one. Like having a backup system. We moved in to a new house and this information is awesome. Thanks so much, I didn't know something like this existed! Thanks for this! It's great info for my new house. Thankfully, here in Vegas, we don't have to worry about basements. Growing up in Chicago however, this was always a huge issue. I didn't even know these existed. We've never had a basement, so I just didn't know what it took to keep it dry. We definitely need one of these. We have a backup pump on our sump pump that works on water pressure just to make sure. But this winter we had ice in our line that blocked it and if we hadn't been home for a snowday, we would have come home to a flooded basement. We have a newer sump pump. I wish we had a battery back up. We don't have a basement cause we live in an apartment building. It was interesting to find out everything that is needed to keep it dry, though. My mother in law keeps having the issue with flooding in her basement. She could use this info. A great article for anyone who currently or even potentially have water issues in their basement. Thankfully we have not but I know plently of people who have. My MIL just cleaned out 6 inches of water in her basement. Her sump pump fails all the time and it's a miserable thing for her when it does. We have a mini waterfall in our basement! The water drains into a french drain but it is still annoying! I don't have a need for a sump pump, but my daughter's whole first floor flooded and they had to have one installed. It was a horrible mess. They have since sold that house. UHG, flooding causes so much damage it can be a nightmare to get things back to normal. I love that you get a text to alert you, that's brilliant. We're fortunate to not have a basement to deal with but I know a few people who could use this back at home. We don't have a basement thank goodness. I have to say the whole idea of a sump tank sounds intimidating... Glad you found one that works for you,. So nice that there's an alarm system to warn you. No one wants to deal with a sump pump failure!